Leaked slides detail an Intel NUC mini PC fully-equipped with an eight-core / 16-thread i9, set to launch in 2020. 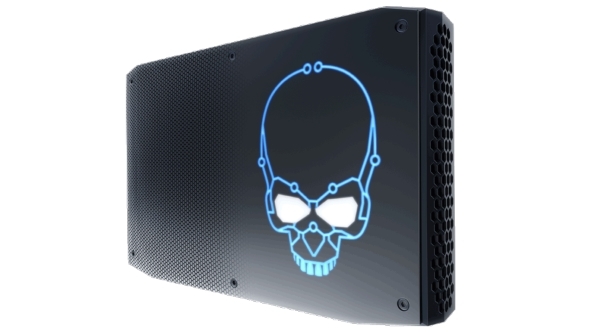 Listed as a Coffee Lake component, the ‘Ghost Canyon X’ NUC919QNX – along with its NUC9i7QNX six-core compadre – both ditch on-chip AMD graphics in favour of a more powerful processor. On integrated GPU chops alone these machines won’t make for particularly great gaming rigs – not without a little discrete graphics love or some super secret GPU sauce from Intel. Luckily, the specs listed within the slides indicate these NUC machines will feature a single PCIe x16 slot. That should mean scope for a discrete GPU to supercharge the Ghost Canyon X NUC’s gaming potential, real estate pending. With a 45W processor, multiple M.2 drives, two memory slots, eight USB ports, and two Thunderbolt compatible USB-C connections, there isn’t going to be a huge amount of space left over in the tiny NUC chassis for any sizeable, or powerful, discrete GPU in a traditional form factor. There’s a chance this model will come with a spooky ghost on the front akin to the Hades Canyon RGB skull, however. Intel don’t fail me now. According to the leaked slides from PCEVA (via Guru3D), the new NUC will launch sometime in 2020. 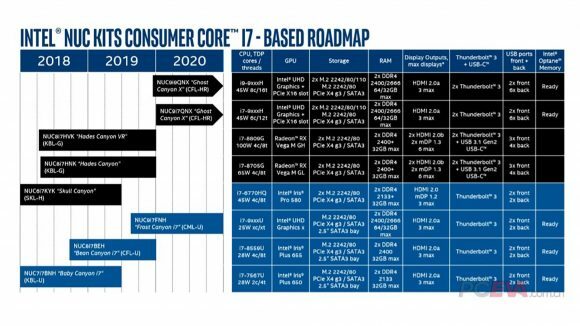 That means a Coffee Lake chip, supposedly 9th Gen, will be launching in a brand new product as far off as 2020. That’s when Intel has been touting full 10nm production, and is supposed to offer us some respite from the barrage of Skylake iterative 14nm CPUs over these last few years. It all seems a little unlikely in that time frame. But as with most of these early tech leaks and proposed roadmaps, it’s all we’ve got to go on right now. Salt, pinching, and all that. Intel’s current enthusiast NUC lineup consists of Hades Canyon, a high-end VR capable machine sporting the Intel / AMD Vega Hybrid Kaby Lake G chip. The Core i7 8809G offers just four-cores and eight-threads of processing power, but subsidises that somewhat with AMD’s Vega M GH GPU, complete with 24CUs. And despite Intel and AMD’s renewed rivalry in the CPU space, Intel is still opting to fit AMD silicon into its latest NUCs. Although no longer on the chip itself. In the far more modest NUC bracket, Intel recently started shipping its first 10nm Cannon Lake CPU, the i3 8121U. This is a mere dual-core part and lacks the iGPU component found on almost all Intel chips. Instead, it’s paired with AMD’s low-power Radeon 540. 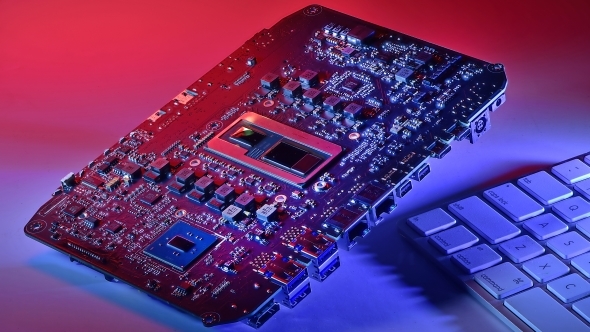 With a 7nm GPU architecture, AMD Navi, on the way next year, and even Intel’s own discrete graphics on track for 2020, Chipzilla may be able to squeeze a little more GPU power into the minuscule NUC form factor once 2020 finally rolls around.